Over half of American adults play video games, and four out of five young adults play. Among adults, computers are the most popular gaming device, but among young adults gaming consoles are preferred. Virtual worlds only draw a small crowd. Independent of all other factors, younger adults are considerably more likely than older adults to play games, and the likelihood that an adult is a video gamer decreases significantly with age. Fully 81% of respondents 18-29 years old play games, while only 23% of respondents 65 years old and older report playing games. Overall, men (55%) are slightly more likely than women (50%), and urbanites (56%) are a bit more likely than rural-dwellers (47%) to play any kind of digital game. There is no significant difference in game playing across income groups or between suburbanites and adults from other locales. A person’s education level is another predictor of video game play. Some 57% of respondents with at least some college education play games, significantly more than high school graduates (51%) and those who have less than a high school education (40%). Current students who are 18 or older are also avid players. Notably, 76% of students (82% of full-time and 69% of part-time students) report playing games, compared with 49% of non-students. Internet users are also significantly more likely to play games than those who are not online. 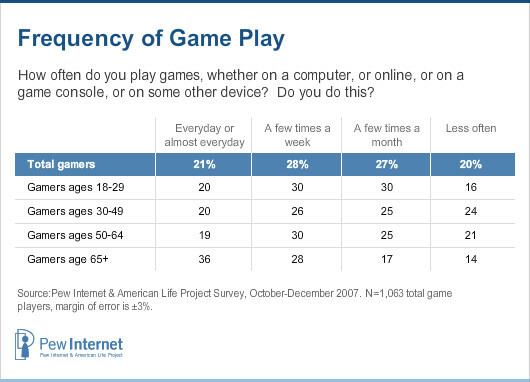 Fully 75% of adults in the survey use the internet, and 64% of internet users play games. By comparison, just 20% of non-internet users play games. Younger generations tend to dominate the gaming world; however, older respondents who do play games are more avid players. Older gamers, particularly seniors, tend to play games more frequently. Over one-third (36%) of gamers 65 and older say they play games everyday or almost everyday, compared with 19% of adults aged 50-64, 20% of adults aged 30-49, and 20% of adults aged 18-29. Senior gamers may play more frequently because they have more time to play than younger gamers, as 77% of senior gamers reported being retired. Almost half (49%) of all adult gamers reported playing games at least a few times a week. Computers are the most popular equipment for video game play; consoles are the favorite gaming hardware among the youngest players. Of the devices that can be used to play video games, computers are the most popular. Fully 38% of adults report playing games on desktop or laptop computers. This percentage compares with 28% who play on game consoles like an Xbox, PlayStation or Wii; 18% who play on a cell phone, Blackberry or other handheld organizer; and 13% who play on portable gaming devices like a PSP, DS or Gameboy. These trends contrast with the gaming experiences of teens. For those ages 12-17, game consoles are the most popular gaming device, and 89% of teen gamers use consoles to play games. Teen gamers are no more likely than adult gamers to use computers to play games, and while adult gamers are more likely to play games on cell phones or Blackberries than on portable gaming devices, teen gamers show the opposite set of preferences, preferring the portable devices to cell phones. 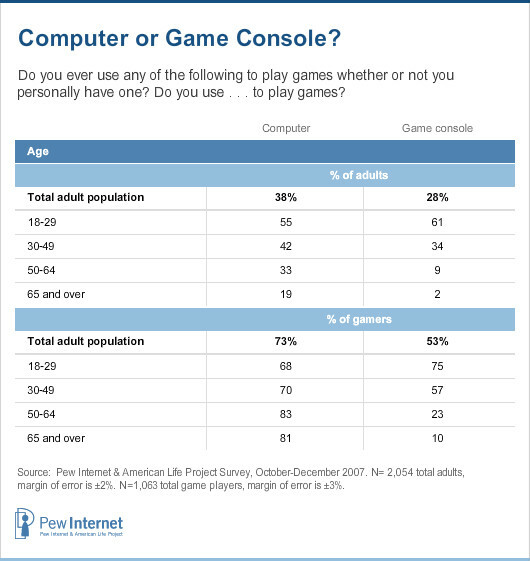 Like teens, a majority of young adults play games on consoles, while older gamers prefer computers. 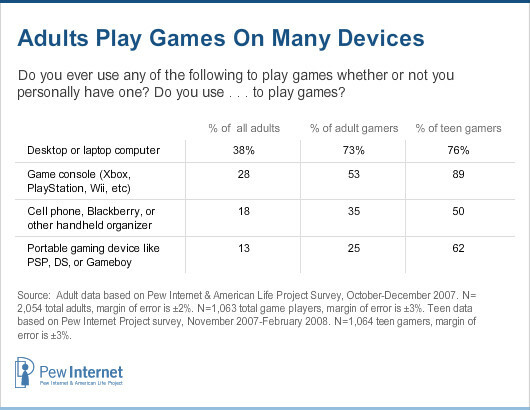 Young adults, 18-29 year olds, are the most apt to play games on any given device. But, while computers are most popular with the total population, younger Americans are more likely to play games using a console than any other type of video game-playing device. Like their teen counterparts, a majority (61%) of respondents 18-29 years old play games on consoles, compared with 28% of all adults who use consoles to play games. Teens, however, are even more likely than young adults to play games on consoles; 86% of teens play on consoles. If an older person is going to play games, he or she will most likely use a computer. Some 19% of seniors 65 and older play games on computers, while only 2% use each of the other devices listed. Similarly, Americans ages 50-64 are much more likely to use computers than to use gaming consoles, cell phones (6%) or portable gaming devices (5%). When looking specifically at gamers, these age-based preferences are even more distinct. Nearly three out of four gamers (73%) use computers to play, while just over half (53%) use game consoles. Gamers 50 and older are significantly more likely than younger age groups to use computers. Middle-aged gamers, 30-49 years old, prefer to play on computers, but a significantly large percentage also plays on consoles. Young adult gamers are the only age group to prefer playing on game consoles; three-fourths (75%) of 18-29-year-old gamers play on consoles. Certain demographic groups – men, minorities and parents – use some devices more. Men are significantly more likely than women to play games on gaming consoles: 35% of adult men say they play games on a console compared with 21% of women. Men and women are statistically equally likely to use all other gaming devices, including computers, cell phones, handheld organizers and portable gaming devices. Blacks and Hispanics are more likely to play games on smaller, mobile gadgets. While there is no statistically significant difference in game play between ethnic groups on computers or game consoles, blacks and Hispanics are significantly more likely than whites to use cell phones and portable gaming devices to play games.3 One-quarter (25%) of blacks and 27% of Hispanics report using a cell phone or Blackberry to play games, while only 16% of whites reported doing so. Similarly, 18% of blacks and 21% of Hispanics use portable gaming devices, compared with 11% of whites who use these devices to play games. Independent of other demographic categories, parents are more likely to play games than non-parents. Fully 66% of parents or guardians of children 17 years old or younger play games, compared with 47% of adults who are not parents who play games. 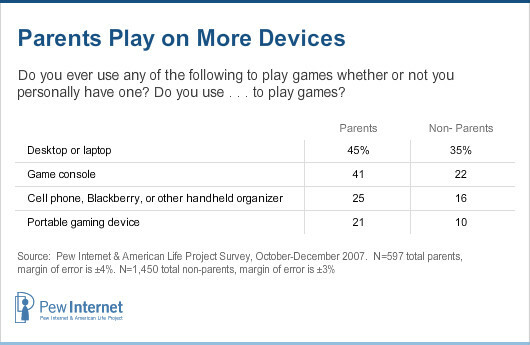 Parents are also more likely to play games on every kind of device we asked about than respondents who were not parents. Online games have a modest place in the world of adult gaming. Virtual worlds and MMOGs have yet to catch on. Just 2% of gamers say they have ever visited a virtual world, such as Second Life.7 While there are no significant age or other demographic differences between adults who visit virtual worlds and those who do not, teens are significantly more likely to visit virtual worlds. One in ten teens and 11% of teen gamers reported visiting virtual worlds. A total 6% of adults say they have created an avatar, or online representation of themselves often used for participation in virtual worlds and in some online games and social networks. Slightly more game players, however, say that they have played MMOGs. Still, only 9% of gamers play these types of online games. 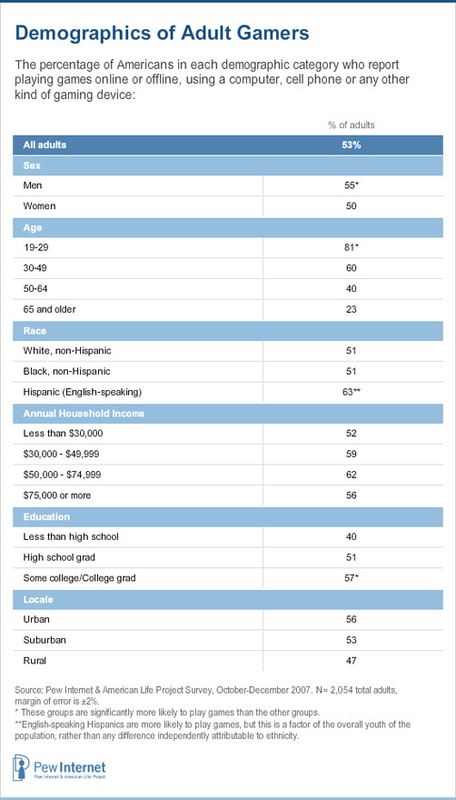 Again, young adults are significantly more likely than average adults to play MMOGs, as 14% of 18-29-year-old gamers report playing these types of games. Teens are even more likely to play MMOGs, with 21% of teen gamers reporting MMOG play.